LEGAZPI CITY (November 15) – Two suspected gun-for-hire was gunned downed by responding policemen (Police Officers Solano and Borja) after a shooting incident occurred in front of a fast food chain at Ayala Malls here, 5:30 PM Wednesday. 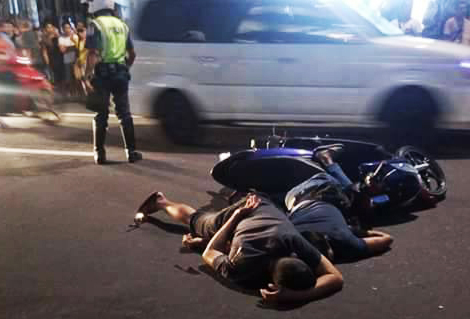 In an interview by DZGB News, P/SUPT NILO S. BERDIN – Legazpi City Chief of Police identified one fatality as Marlon F. Magsino, a resident of San Andres, Malvar, Batangas while his backride Michael Malveda y Beltran, 43 years old a resident of San Lucas, Lipa City was brought to Bicol Regional Training and Teaching Hospital (BRTTH) for treatment due to multiple gunshot wounds. The victms of the riding in tandem were rushed to the Albay Doctor’s Hospital and identified by Berdin as Alex Herman Alemania, 48 years old , Lucky V Small Town Lottery (STL) operator in Albay and his companion Ana Marie Querubin y Lagman. As of this writing, Querubin was declared out of danger by the attending physician while Alemania was still inside the operating room.